At the end of The Spy Who Loved Me, we are promised that James Bond would return in For Your Eyes Only. Alas he didn’t. Instead the producers, noticing that a certain small space movie called Star Wars was shaking up the box office, it would seem sensible then to put Bond into space. Sorry, I mean ludicrous, because that is exactly what Moonraker is like, the silliest Bond film with our hero ending up in a lazer beam fight on a space station. Bond has always been outlandish but this is a step too far. A space shuttle has been stolen and James Bond is sent to the owner, Hugo Drax, who immediately is hiding something and wants the secret agent dead. As Bond starts to look deeper, he discovers a plan involving a poisonous gas created from a deadly flower, a scientist called Dr Holly Goodhead, who has her own secret and having to face the return of Jaws. The film doesn’t exactly start with a bang. We get a decent pre-credit sequence with Bond being pushed out of a plane without a parachute by his nemesis from The Spy Who Loved Me, the metal-teethed Jaws. Then we get the dullest Bond theme (sorry, Dame Shirley) which, while having that Bond quality, just doesn’t have that ummph that previous themes have delivered. Once that is over, we get into the story and quite frankly, it’s all over the place. Bond goes to California to Venice to Brazil, looking for clues to the stolen space shuttle and finding more, while being involved in some very contrived set pieces, the strangest being a chase through the canals of Venice in a speed gondola that turns into a hovercraft. The gadgets become more outrageous too. A speed boat that turns into a hand-glider, a watch with a pack of explosives and, most bizarre of all, a gun that is attached to Bond’s wrist and operates on his nerves. This comes in very handy on several occasions. There are some good in this film. A fight on a cable car with Jaws provides some excitement and the casting this time works well too. Lois Chides as Holly provides beauty with a bit more get-up and go, as she gets stuck in with the fight sequences, even though she was pregnant at the time. Richard Kiel’s Jaws proved so popular from the previous outing, he had to come back. This time, he does turn good and he does find love. The ace in the pack is Michael Lonsdale’s particularly evil, Hugo Drax. With his softly spoken delivery, he uses his Dobermanns to kill one of his employees, in one of the film’s more shocking moments, while perfectly throwing out lines like ” Take care of Mr Bond. 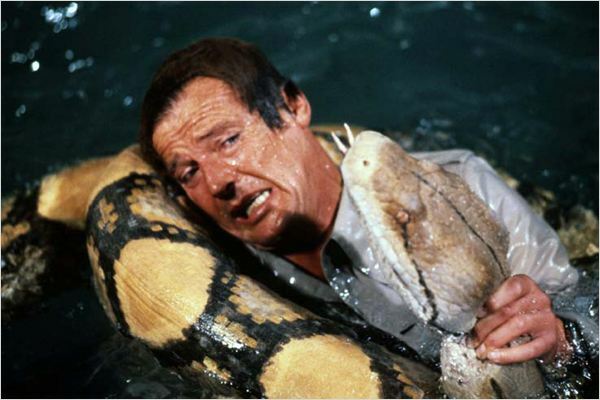 see some harm comes to him!” As for Roger Moore, returning for the fourth time, he still has the charm and the tongue rammed in the cheek, even if the one-liners are a little weaker this time and the sexual innuendos a little more shocking. 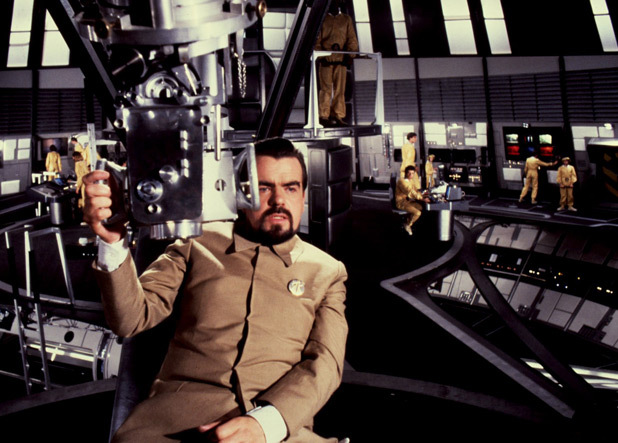 Moonraker is still a fun Bond film but compared to his past (and his future) it doesn’t come close to being as good. Once the finale occurs, a big battle in space with lazers firing here, there and everywhere, you know that Bond needs to be grounded immediately, which they do in the next installment, the previously promised For Your Eyes Only.